EDIT: Ok, alot of people think I drew those pic, as much as I like to take credit for it, too bad I can't, I found those pics from all over the place. U can thank http://www.seed-forum.com/ for this. Nice. I like all of it except for Mia. Very good. Keep up the good work. Great wall!!! I'm pretty sure you drew that one. I must say that it is pure talent! Great idea of bringing the next generation of SEED girls in that pic along with her holiness, the real Lacus, in the background. Just hope the next wall to include also Milly, Talia, and Murrue. Very nice wall Love the gundam seed girls. Nice job keep it up, Fav for sure. Nice and pretty GS wallie, zephyr! 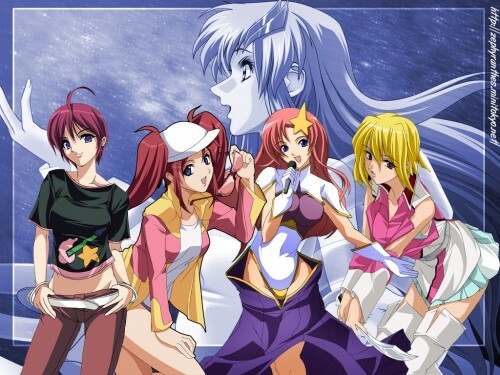 ^_^' The simple BG doesnt distract from the gorgeous Gundam Seed girls! Lacus looks a bit scantally clad, but hell I'm not complaining! XD The other character are pretty and I like how the other Lacus on teh BG is blended with the BG colors! Nice work, zephyr! Wow, this wallpaper is really good, I like the background with Lacus. It's a good wallpaer, but I miss Cagalli, nervertheless I like this wallpaper. WOW! Your really good at this stuff! Even though I hate three girls there, your really good at drawing if you drew this! it is so cute... but cagalli, the real lacus and miriallia is missing. sob... still it is good. it is so beautiful... but cagalli, the real lacus and miriallia is missing. sob... still it is good. Nice....i think it'sgood you have this much talent!! Keep up the good work!! Thanks for sharing the wallpaper!! stop!!!!!!! where is cagari har????????? ?